This is, by far, the most common use of ceramic tile, and if I've learned one thing over the years, it's that every installation is unique in one way or another. 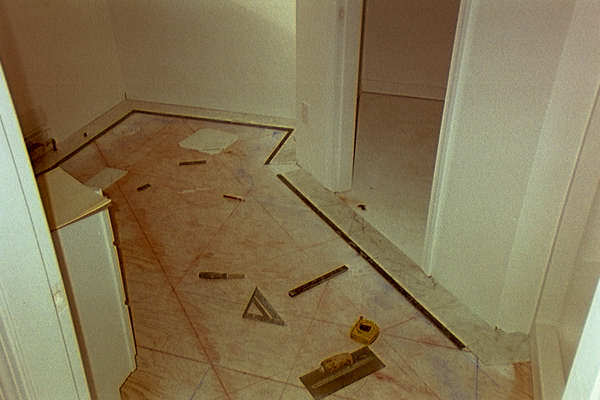 Whether it's the composition of the subfloor, the prep needed to ready the subfloor to receive the tile, the layout of the tile (or the room to BE tiled), or the design of the installation, something is always different. The second constant is that the floor must be flat. This is especially important when using large format tiles. 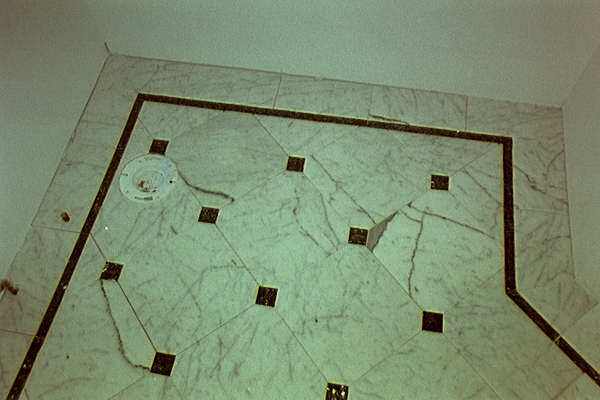 Whereas with smaller tiles, the worst that would happen would be to see small dips or humps in the finished floor, with larger tiles, it could cause lack of proper adhesion to the subfloor, resulting in a failure of the tile installation, not to mention tile corners sticking way up from the floor's plane. 2) You can use mastic (tile glue or adhesive) to install a floor. There are two types of mastic currently on the market-- type one, and type two. The type two can only be used on gypsum wallboard (sheetrock). However, most type one pails will say they can be used over concrete, plywood, or CBU (cementitious backer units), and that they can be used on floors, as well as walls. There are several problems with this. First, mastic doesn't dry half as quickly as thinset does. Tile set on a floor with mastic could still be moving too much to even grout, days after it's installed, whether it be over concrete or plywood. Secondly, mastic is made to be used in a thin layer. The thicker the layer the longer it takes to dry, and if used too thick (such as with the heavier notched trowels needed to set most floor tile), it won't ever completely dry. It'll stay pliable, which means the tile will always be able to move, which means the floor will fail. Lastly, mastic has a nasty habit, even after drying, of being able to re-emulsify (meaning water will soften it back up again), which means even months after installation, the tile could come back up again, with no other agitation. 3) Premixed thinset is the newest and best innovation in the tile industry. This misconception is mainly targeted toward the DIY market, meaning the homeowners who want to do their own work, so they can be proud of the finishes in the home that he (or she) did himself (or herself). Premixed thinset is nothing more than mastic which has a very fine sand mixed into it to give it bulk. 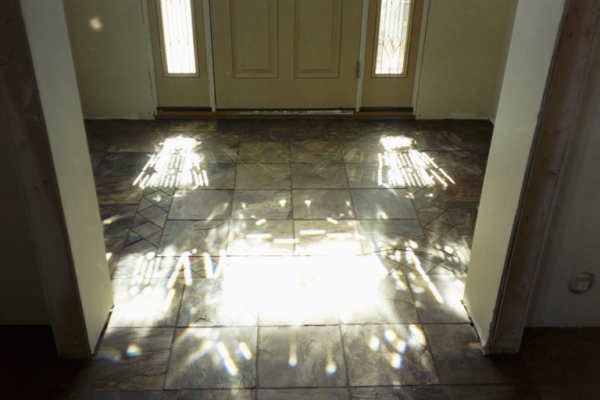 From what I've seen, it's completely useless in the use for which it was intended, that being replacing conventional Portland cement based thinsets on floors, to add ease to installations. I've seen cases where this stuff was STILL soft, 6 months after installation. This is a subject that's very hotly debated within the industry. 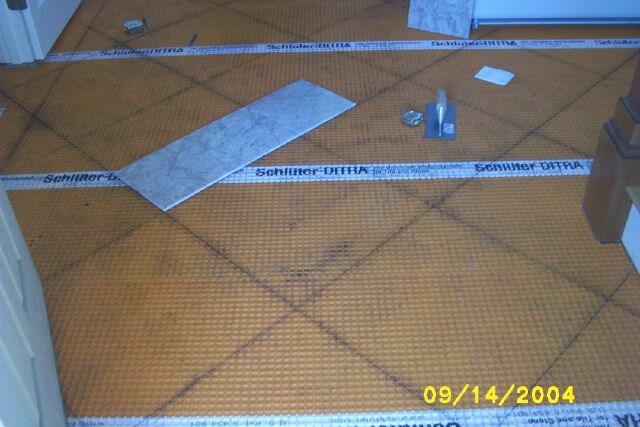 It seems every manufacturer has a thinset that they say can be used over resilient flooring (sheet vinyl) or vinyl tile. The problem with that is twofold. With all the different types of vinyl flooring out now, it's tough to know which ones can, and which ones can't be tiled over. Cushioned vinyl's are out. 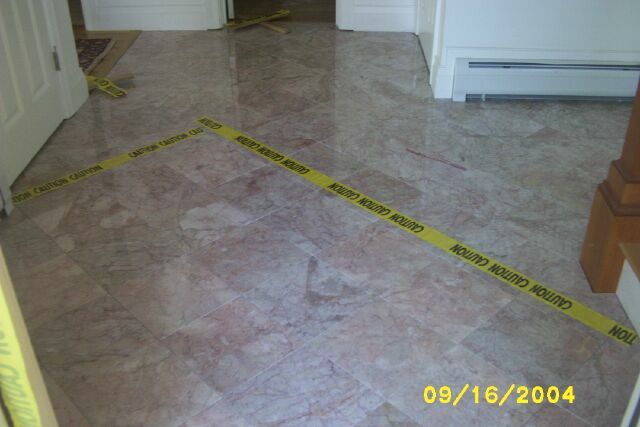 They can compress, causing voids under the tile, ultimately causing failure. Also, not all sheet vinyl is glued solid to the floor. A lot of times, vinyl installers will only glue the edges and spot glue in the center, and if you thinset the tile to it, it won't stay very long. In my opinion, vinyl tiles are out, as well, due to the fact that the thinset bond is only as good as the bond of the surface under it, and I've seen vinyl tiles ( especially peel and stick) let go way too easily. The same is also true for sheet vinyl. 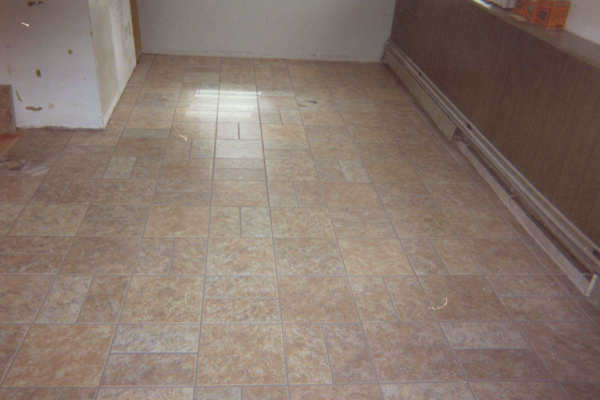 The second problem with tiling over vinyl is the underlayments used for vinyl installation. Normally, in woodframe construction, there are one of several underlayments used-- luan, 1/4" particle board, 1/4" plywood, and sometimes even MDF (medium density fiberboard). ANY of those in a tile subfloor is a guaranteed failure. 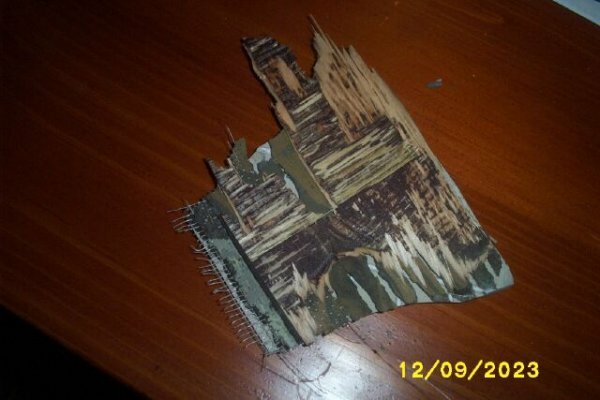 1/4" plywood has a nasty habit of delaminating (the layers come apart). Luan has the same problem, plus it can compress to 1/2 its original thickness from normal residential foot traffic (I've seen this happen). Particle board (as well as MDF), just from humidity, can expand enough to pop tile loose. Any of those can cause failure, and unless you pull the vinyl, you don't know for sure whether the vinyl installer just went over the existing subfloor, or added one of the underlayments mentioned. All in all, it's an extremely risky installation, and my question is why, when spending the money it costs for a tile installation, would you want to gamble on it? 5) When building up a subfloor, you're better off adding layers of cement board, rather than plywood. After all, cement is stronger than wood, right? Wrong. Cement board (CBU) is only there as a bonding surface that's more suitable than plywood as a bonding surface. Although it does add some, the amount of structural support is barely negligible, whereas plywood will add a lot more strength to your subfloor. As I previously stated, I don't have a problem going directly over plywood, but in the instances where a client has demanded CBU, I prefer to only use 1/4" thick CBU and use plywood for the rest of the height of the floor for exactly that reason. These are just SOME of the more common misconceptions. I'm sure there are a lot more that I'm not recalling. If you've got even the slightest question about whether an installation will work or not, your best bet is to go into one of the many forums on line, where you can ask a multitude of professional contractors what their opinions are. I've listed several on my links page, including the two I frequent-- floorstransformed.com and johnbridge.com . As long as directions and subfloor prep specs for each are followed, any one of these substrates will give a long lasting installation. There are a couple of "rules" that prove themselves to be only guidelines on a daily basis. One is that there should be no cuts less than a 1/2 tile. So long as you're only cutting into four sides, this isn't a problem. 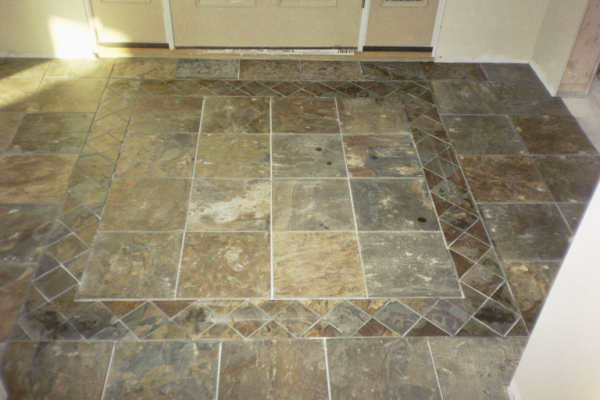 However, if you're doing a main floor, where there's a kitchen, a hallway, a mudroom, a 1/2 bathroom, a laundry room, and maybe a front entry (or any combination of those), you'll drive yourself crazy trying to make sure you hit all surfaces with more than half tile cuts. Most times, it's impossible. The other "rule" is to center the area, again so that the cuts are more than half a tile, and again, that doesn't always work as your best bet. The only hard and fast rule is that you want the most obvious cuts, as you come into the area, to be of a decent size. The less obvious the cuts, the less important it is that they be decent sized. Other than that, it's pretty much a case by case basis. For the most part, if you were to look at the floors I've installed, no two layouts are alike. Now, there are several different ways to set the floor up for tiling. 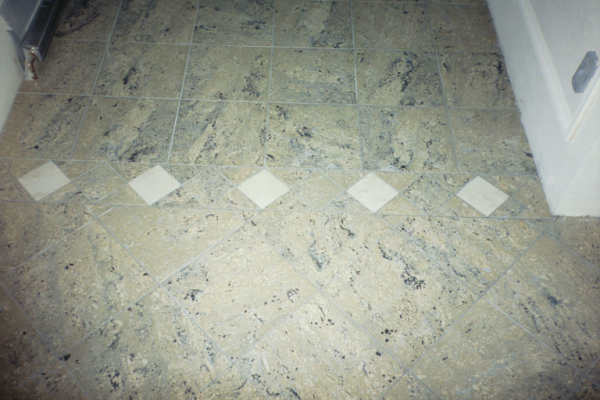 There are those who will snap two perpendicular square lines and use a straightedge for keeping their tile straight, snapping chalk lines every couple of feet, as they work their way out of the area. 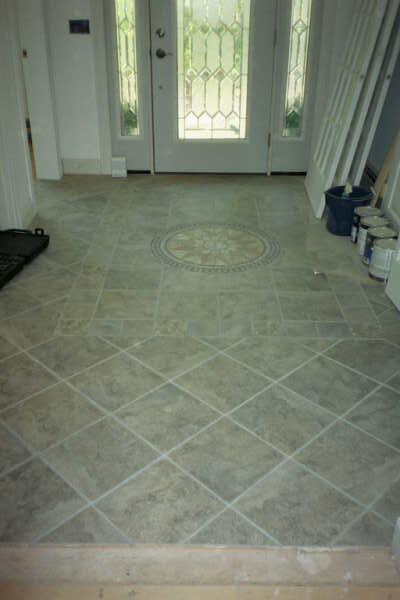 Others will start from the center of the room and use tile spacers to work their way out to the end points. Still others will combine both these methods, using both the straightedge AND the spacers. 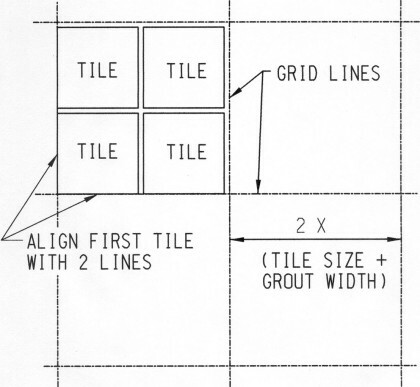 But my favorite way is to grid out the floor, snapping lines throughout the floor to divide it into a grid, somewhat like graph paper (see pictures 7&8 ). I like this method for several reasons. First, so long as you're sure of your original lines being square (which you need to do with any of the other methods, as well), the rest of the grid will be square, as well, and there's no way to go out of square, so long as you keep to your lines. Secondly, you can do all the out of the way areas first, and be completely assured that once you tile the main body of the area, it'll all mesh together perfectly. 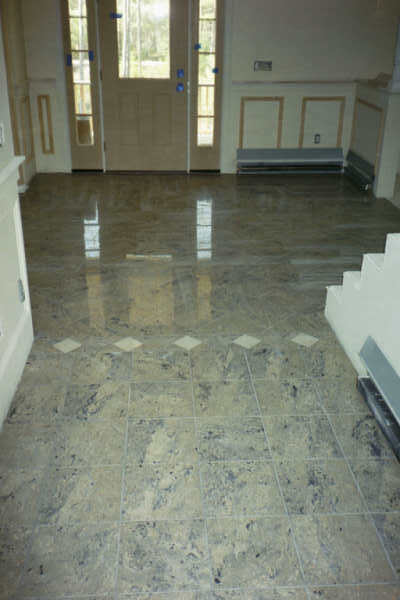 Third, and this is more from a contractor's point of view, I can put several people to work on the same floor, but in different areas, and again, be assured that it'll all come together afterward. Lastly, the area can stay open till the last minute for traffic. 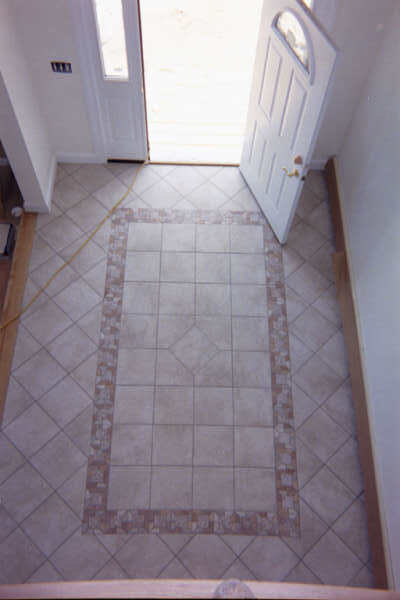 You don't have to worry about tiling in a closet, and having someone walk behind you into an area that you just tiled, or if working in a home that's already occupied, you can leave the area open that much longer for the homeowner to be able to get through, thus reducing the amount of time that the homeowner is inconvenienced (a MAJOR feature when selling my work). None of the other methods afford you ANY of these "luxuries". Not only that, but all I've talked about so far is "simple layouts", meaning layouts with only one tile pattern throughout the floor. Gridding the floor can be even more helpful when using multiple patterns, such as a straight layout meeting a diagonal area, or if you install a "mat" into the area, where there's a part of the floor that's been "cordoned off" by border pieces (called listellos) and the pattern changed inside the border. It'll help you see how it's all going to come out before the first piece of tile is laid, so that if something doesn't look quite right, it (the layout) can still be changed without much of a problem. With my own work, it doesn't matter if I'm doing a 30 square foot bathroom, or 50,000 square feet of department store aisles. I'll grid the floor every time.